In 1989, I was a sophomore at a small Midwestern college. My friends and roommates were largely apolitical and, if I am going to be honest, we weren’t really paying attention to what was happening in the world. We were sheltered in the way that many young adults are and had yet to become aware of our place. But then history happened. On November 9th of that year, the Berlin wall fell, and the way the world changed grabbed my attention and never really let it go. The Soviet Union was collapsing under its own weight, and the future of the planet seemed more secure than ever. The Cold War had thawed, and the world seemed to be entering spring. Osama Bin Laden and the various fundamentalist terrors had yet to be unleashed. There was most certainly an optimism in the East and the West. Gorbachev was a physical manifestation of common sense, and the inevitable world-destroying nuclear Armageddon promised by the Cold War seemed to be permanently averted. While I, and most people, looked at these developments from a fairly practical, political perspective, there were many Russian writers and artists that were fueled by these events but who also, no doubt, viewed them with a pessimism forged by decades of disappointment. 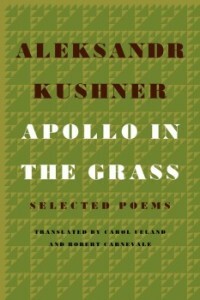 Aleksandr Kushner’s collection, Apollo in the Grass, includes poems written between 1988 and 2010. However, Kushner was born in 1936 and lived through post-WWII Stalinist Russia and the Cold War, and this is reflected constantly in his later work. Kushner experienced most of the critical historical moments in twentieth century Russian history, and this directs his writing, gives it historical gravitas, and allows for his work to be informed and important. It is a cerebral mix of art and historical perspective. It is particularly striking that Kushner’s work produced prior to the fall of the Berlin Wall would seem apropos even if it were written today. And sinks under grief – like us in Russia. Where eternal Spring springs more enticingly. Do not inquire of God: He is not in this world. The heavenly kingdom is…heavenly, its light unearthly. The earth receives just a few glimmers. So most of the world lies in evil. Apollo in the Grass does not only capture life in Russia, past and present, but also touches on universal truths of love, life, art, and beauty. Aleksandr Kushner’s value as a writer is largely in his versatility. While much of his best work is related to his mother country, his assessment of the human condition is equally valuable and rewarding. Jeff Knops has degrees in History and Political Science. His work and pleasure has brought him to Asia, Central America, Western Europe, and the Middle East. He lives and reads in the Pacific Northwest.